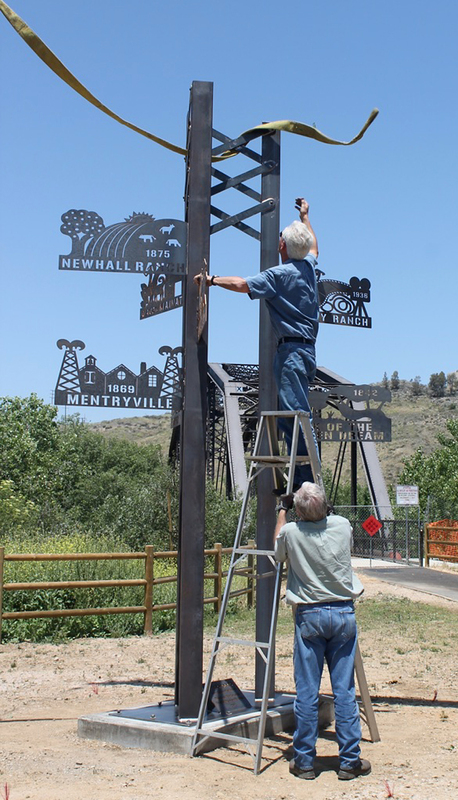 Local artists Idelle Okman Tyzbir and Dianne Foderaro will unveil their sculpture, Crossroads at Iron Horse Trailhead, on June 15 at 10 a.m. 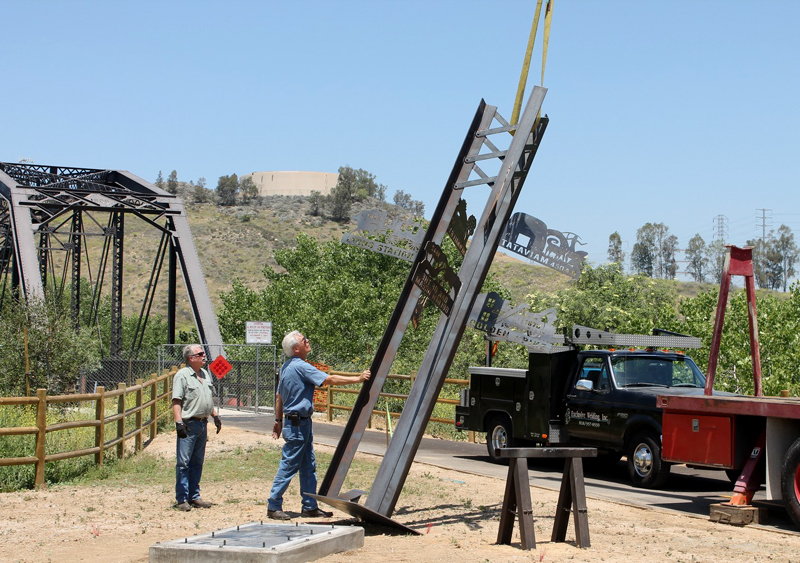 The 15 foot structure recognizes the contribution of the railroad and Santa Clarita history and is located near the railroad trestle on Magic Mountain Parkway. “I am so excited about it. Dianne and I are really looking forward to the dedication. And just having a work of art so large—it’s good, and people really appreciate it. It’s so nice to get all the positive feedback and I can’t wait for a lot of people to see it in person,” said Tyzbir. 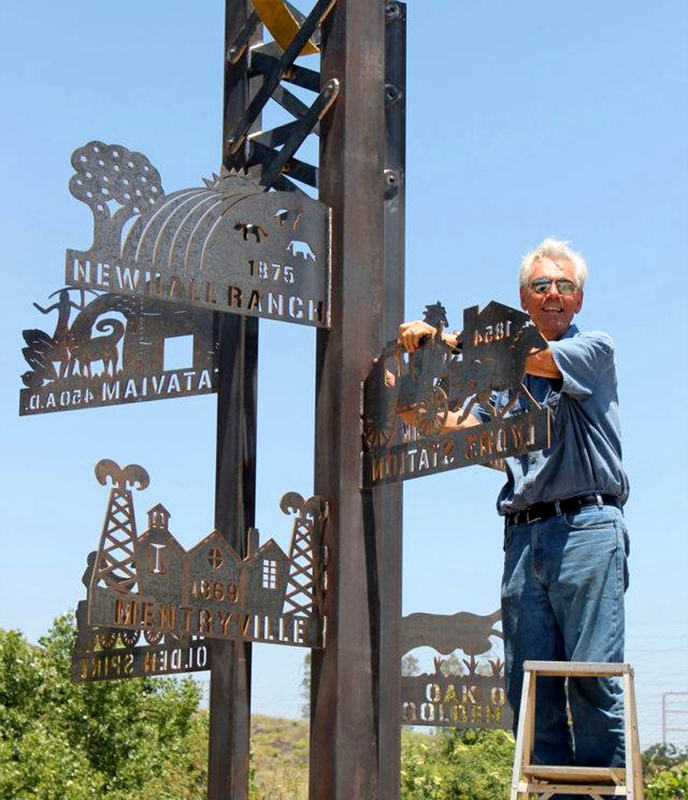 “The other thing that I think is so great is that it’s about Santa Clarita history. And a lot of people, because they have just moved into the area or haven’t lived here that long, don’t know what a great valley this is and how much history is here. So, I’m hoping that this will bring forth more information and put a lot of pride into the people who live here because Santa Clarita Valley is really phenomenal” said Tyzbir. 1. Tataviam: This band of Native American Indians inhabited the Santa Clarita Valley beginning in 450 AD. The arm points in a general direction since the tribe hunted and gathered throughout the area. 2. Oak of the Golden Dream: In 1842, gold was discovered in the Santa Clarita Valley when Juan Francisco Lopez pulled up some wild onions and found gold attached to the roots. A gold rush soon followed. 3. Lyon Station: Sanford and Cyrus Lyon bought Wiley’s Station in 1855 and renamed it Lyon’s Station. By 1868, the station consisted of a large-frame building housing a store, post office, stage depot and tavern. Once travelers made it through Beale’s Cut in the Newhall Pass, the station provided a place for a change of horses and a hot meal. 4. Mentryville: The location of the first California oil discovery in 1869 is in Pico Canyon. A boomtown rose up on this site to support those who came to work in the oil fields. 5. Lang Station: This is the site of the 1876 golden spike ceremony uniting the railroad lines of Northern and Southern California. The station was originally built in 1876 and then re-built in 1936 following a fire. Lang Station remained in use until the late 1960s when the Southern Pacific Railroad ended passenger service. Fabricator Roger Green guides the sculpture onto its base. 6. Newhall Ranch: The land purchased by Henry Newhall when he relocated his family from San Francisco to Southern California in the 1870’s became Newhall Ranch. Here he raised cattle and grew crops. Following his death in1882, his four sons incorporated his business holdings and formed the Newhall Land and Farming Company. 7. Melody Ranch: Developed in 1936 as the Monogram Movie Ranch, it was sold to Gene Autry in 1953 and became Melody Ranch. It was the location of many western movies and television shows and is now the home of the annual Cowboy Festival. The Crossroads at Iron Horse Trailhead is located at 25311 Magic Mountain Parkway near Tourney Road.